An 8Mp matrix in the zoom-lens class is a yet another step forward in digital camera evolution. Before, digital cameras with built-in lenses had lower resolution than reflex ones. Now, one will have to think twice whether to choose 6 Mp with interchangeable lens or 8 Mp with non-interchangeable zooming. It will cost you quite a sum to buy reflex lenses with such range of variable focal length (28-200 or even 35-280 mm), which are, on top of that, made for 8 Mp. These cameras will certainly look inferior to the reflex ones because of a limited range of long exposures and sensitivity, or (which is almost the same) due to high noise level caused by an increased sensitivity and prolonged exposures. The reason for this lies in matrices of a small absolute sensor size (8.8 x 6.6 mm (2/3" standard)), that have been fit into 8 Mp. All reviewed cameras have the same maximal frame size of 3264 x 2448 pixels. Cyber-shot F828 12 elements in 9 groups, 3 asph. The camera features an L series red-ring lens and its name contains a suggestive Pro. The advertising brochure mentions an up-to-A2 printing while the lens has a quiet USM drive that is supposed to speed up zooming. Focusing is hybrid: a passive TTL + external. The DIGIC processor must ensure speedy work, low noise level and the right colour rendering with sRGB and Adobe RGB coding. Shutter speed can be controled by exposure, aperture, and the neutral filter. Manual focusing is performed with the lens ring which manages zooming in the AF mode. Compatibility with the PictBridge standard enables printing without a PC if the printer supports the standard. Apart from frame-by-frame and serial shootings, the camera also has an interval mode where up to 100 frames can be made at intervals from 1 to 60 minutes. More details about Canon PowerShot Pro1. 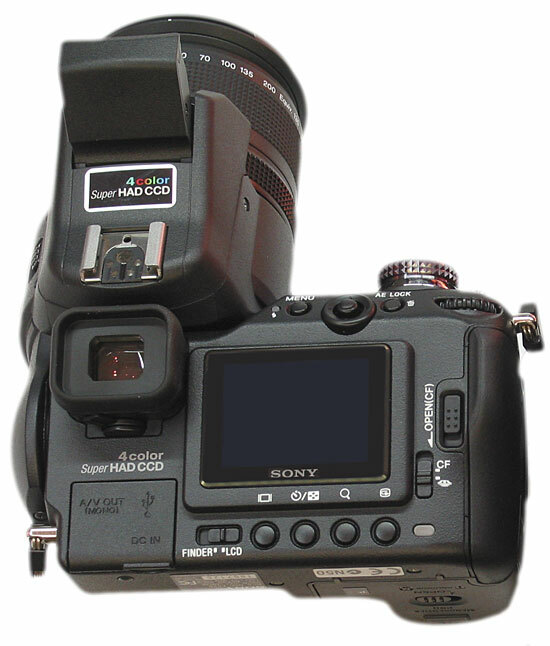 Features: electronic viewfinder with a high resolution of 922000 pixels (which is 3-4 times higher than other cameras have) and a 30/60 f/s variable refresh rate, the Anti-Shake function (matrix stabilisation that enables hand shooting at exposures 3 times longer than in cameras without stabilisation), the AF spot movable almost throughout the frame, 544x408 video recording with sound and a 30 f/s frequency, depth-of-field estimation mode. The camera is the closest to the reflex ones in the sense you get at shooting due to a mechanical zooming drive and a lens focusing ring. Exposure index is up to 800, maximal close aperture is f/11. A histogram is shown in the display at shooting. More details about Minolta DIMAGE A2. The camera design continues the Nikon 5000/5400/5700 line. The lens (35-280 mm equivalent) has the longest focus among the reviewed cameras. A histogram and a grid with diagonals are displayed at shooting. Zooming is a lever one as there are no zooming and focusing rings. The serial mode is marked by the option to write the last five (and not only the first five) shots to the card and by the selection of the best serial shot in terms of exposure and focusing (the BSS function). Interval shooting enables to make series at given intervals (30 sec to 60 min) as well as to shoot an interval series and record it as a video clip. More details about Nikon COOLPIX 8700. It has the most frugal zoom which is 28-140 mm in equivalent of a 35mm camera. Zooming is a lever one. The AF system is hybrid: TTL and an external passive AF sensor (it is called triangulation method in Canon). The Sunshine display is modified for the use in a bright sunlight. C8080 has 8 sets of shooting partameters, the richest variety of personal settings. Exposure metering (besides customary Digital ESP, spot, and centre-weighted) is possible by 8 spots chosen at the photographer's own will. A histogram and a screen grid are displayed at shooting. The camera features a 4-colour RGBE light filter (E stands for emerald). Super HAD CCD SONY with an emerald filter ensures a better transmission of green-blue and red shades. Real Imaging Processor transforms the RGBE signal in the RBG format, lowers the noises and energy consumption, and also increases operating speed. A rotating Carl Zeiss Vario Sonnar T* lens has two rings that enable a manual regulation of focusing (motorised) and zooming (mechanical). 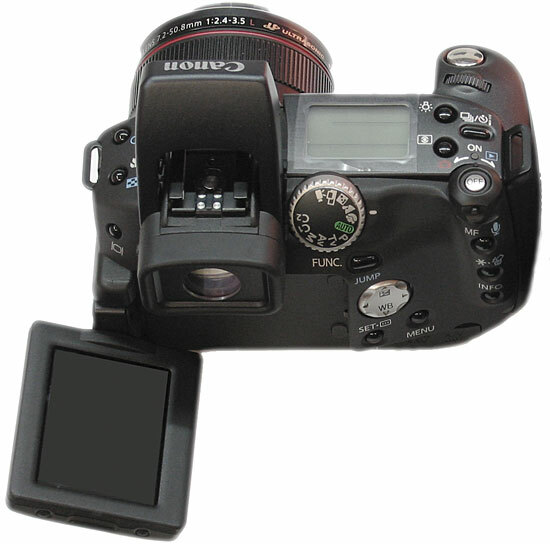 The camera is compatible with Memory Stick and Compact Flash cards. It also features Night Shot and Night Framing modes, a Macro mode with a 2-cm minimal distance to the object, 640x480 video recording at 30 f/s (MPEG1). A histogram is displayed at shooting. 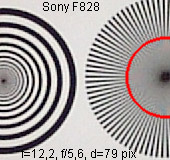 More details about Sony F828. It is not difficult to find a description of each camera, but customers can be interested in their comparison in similar conditions. So, we're going to compare the optics quality and the white/noise balance (a Kodak target). 3) frame centre - aperture about f/5.6 - extreme focal lengths. Because the cameras have the same frame size in pixels, total resolution can be estimated as the resolution of lines per pixel. A red circle in the line target is a blur circle built according to the lines' discernibility in all directions. 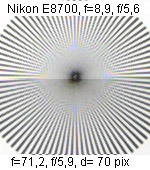 Nikon has the best result for an f/5.6 aperture an a frame centre with the focal length f = 10-12 mm (40-50 mm for a 35mm film). 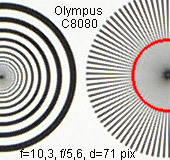 The circle diameter is 68 pixels on 180 target lines (both black and white) which gives 0.84 lines/pixel. Olympus shows a close 0.81. Canon and Minolta have somewhat lower results, about 0.75, and Sony finishes the list with its 0.73. 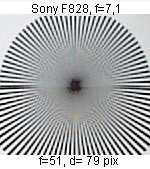 If resolution was the same for the whole frame field, 8Mp cameras would have only a 5Mp (8x0.8x0.8) information capacity for black and white stripes of the target. 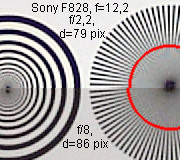 Resolution at extreme aperture values is usually worse than in the second and the third steps. According to our measurements, the minimal aperture is not worse (and even a bit better in the case of Canon and Olympus) for an 8Mp matrix. At f/8, only Canon and Nikon show no significant decrease in resolution. 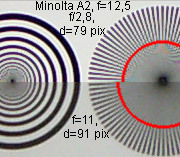 Minolta enables to set diagram f/11 at shooting, but it results in a resolution fall down to 0.63 lines/pixel or just a 3.1Mp information capacity. At extreme focal lengths with aperture f/5.6, resolution is not worse than at a focal length close to a 40-50mm equivalent for a 35mm camera. 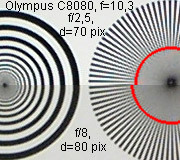 Lenses of each camera have elements made of low-disperse glass, and aspheric lenses, as expensive zoom lens cameras are supposed to render image well both in the centre and on the periphery. To estimate the extent of chromatic abberations and distortion on the frame edge, we'll shoot an annular target in the frame corner for three typical focal lengths: two extremes and a medium one. Using the Levels module (Dmitry Kuznetsov), we'll build brightness histograms for the annular target (fragments above, centre-edge, direction: frame diagonal). Canon, Nikon, and Olympus score best in chromatic abberations at a short focus. Minolta and Sony show somewhat worse results. A long focus yields results similar to the short one, except a certain quality decrease in Nikon. But we shouldn't forget that its lens has the longest focus, so an increase in chromatic abberations is quite justified. 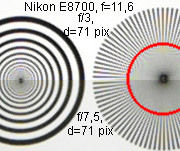 The low sharpness of Nikon's target for the frame edge (target fragments) is not caused by the lens quality but by an impossible simultaneous autofocus use for the edge and timer activation. 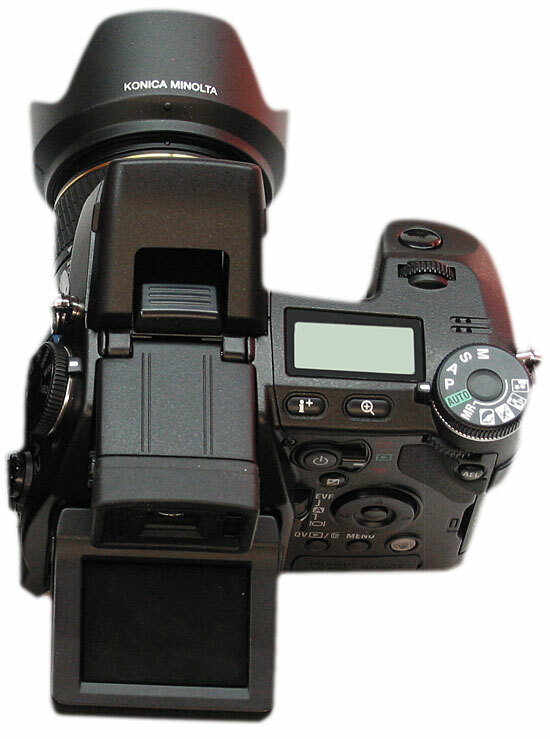 Nikon's autofocus responds immediately before the shooting, while in most cameras, it responds on shutter release. The approach seems quite sensible as auto release is a mode designed to shoot the person himself, and you can't be in the place of shooting when you're releasing the shutter. Therefore, Nikon has the following succession of actions: auto release activation - shutter release - pause - focusing - shooting. But you won't be able to use autofocus to prevent camera shake when shooting a target in the frame corner (where there is no focusing spot), as teh camera will make a refocusing. It is another important indicator of a camera's quality. 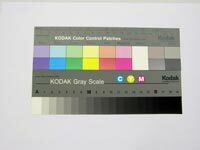 We shot a Kodak table on the white background to draw a comparison within the whole sensitivity range in a mixed artificial light. Noise reduction wasn't forced. Test object: a table on the white background. Fragments of four fields for different sensitivities, 1:1 scale. White auto balance shows various effectiveness in these conditions. 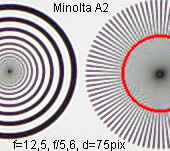 A colour shift is visible in Minolta and Canon. If we edit each fragment (4 for each camera and each iso) in Photoshop using Levels, we can make a more detailed comparison of noises made to look like in ultimate shots. Each quadruple was edited basing on the following algorithm: the white field was assigned with RGB 240:240:240 colour, the black one with 50:50:50. Minolta, Olympus, Sony, and Canon show the least noise at minimal sensitivity. When sensitivity is increased, Canon and Minolta show a noise rise, and Olympus and Sony take the lead. 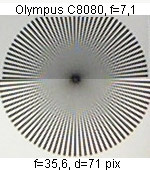 At iso 400, Olympus has the lowest noise. There is no leader in digital image quality. 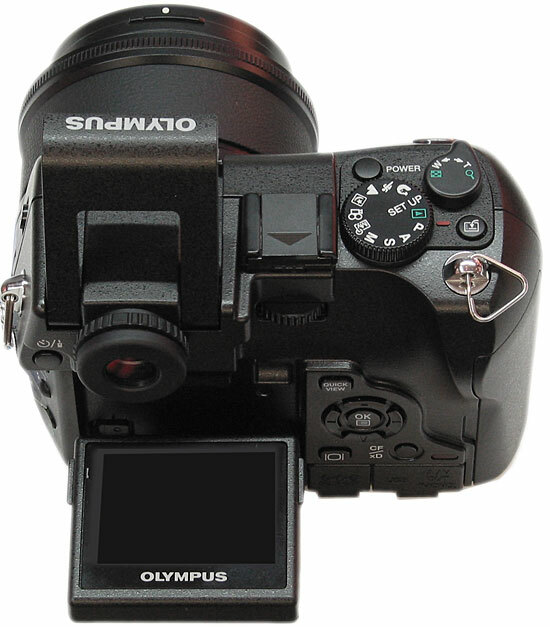 Olympus has a narrower range of possible focal length, equivalent to 28-140 mm for a 35mm camera. Nikon's optics is better for photo hunting and macro shooting, but its minimal focal length is 35 mm (for a 35 mm camera). Canon and Minolta score best in shooting speed (series and frame-by-frame). But Canon's total effective speed is not high due to low zooming and focusing speed. Minolta and Sony proved the most handy cameras to shoot with.